For the 5th consecutive season Our Washington Nationals will host a weekend baseball equipment drive in support of The District Of Columbia Public Schools. In partnership with Major League Baseball's Baseball Tomorrow Fund, Our Team will be collecting new and used baseball equipment (in very good condition) at the entrance gates this weekend at Nationals Park. For Friday's, Saturday's and Sunday's Games against The St. Louis Cardinals, staff will be on hand at The Centerfield Gates to collect all donations. Additionally, as part of the recently announced D.C. Public Schools Initiative, The Baseball Tomorrow Fund will donate $5,000 to the school system's Athletic Departments. DC Public High School Athletic Departments in honor of Nationals Pitchers Shairon Martis and Scott Olsen, as part of the recently-announced Nationals DC Public High School Initiative. The initiative also includes the opportunity for all DC Public High School Baseball teams to host one two-hour practice at Nationals Park, as well as an invitation to all DC Public High Schools to select one home game from a list of available dates to be billed as their night at the ballpark, which includes complimentary tickets for all students in the school and both a pregame and scoreboard recognition. The Baseball Tomorrow Fund is designed to promote and enhance the growth of baseball throughout the world by funding programs, field improvements and equipment purchases to encourage and maintain youth participation in baseball and softball. Since its inception in 1999, the Baseball Tomorrow Fund has awarded grants totaling more than $10 million benefiting nearly 118,000 youth participating in more than 200 youth baseball and softball programs across the United States, Canada, Latin America, the Caribbean, Europe and Asia. For more information visit www.baseballtomorrowfund.com. 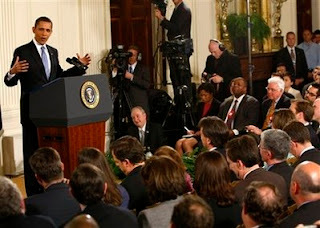 Last night during President Barack Obama's Prime Time Press Conference in the East Room of The White House, The New York Times White House Correspondent, Jeff Zeleny, got off a zinger of a four part question: (Paraphrasing) "Mr. President, in your first 100 Days, what has surprised you the most, troubled you the most, enchanted you and humbled you about being The President Of The United States?" In his typical relaxed style, The President laughed, chuckled, took the question and made the effort to answer the four parter thoughtfully--to everyone's enjoyment listening carefully inside East Room. While pondering what President Obama's response would be, thoughts entered my mind as to how those four questions would be answered after the first 20 Games of 2009 for Our Washington Nationals. Having the night to sleep on it, not responding instantly as The President must most always do, these would be our answers to what has surprised us, troubled us, enchanted and humbled us during this first month of regular season baseball in The Nation's Capital. Surprised to actually realize Our Offense is really potent. At times, Washington hasn't been able to plate runners in scoring position--an issue that has been a consistent problem since baseball returned to Washington, but clearly--when healthy--from the leadoff spot to the seven hitter, Our Manager Manny Acta has players that can get on base, smash the baseball and score some runs. Anderson Hernandez is no leadoff man, but batting 8th--he's a good complimentary fit for the moment. Hernandez also has some speed. It's always worth noting another pleasant surprise--some of our pitchers can actually bunt this year. 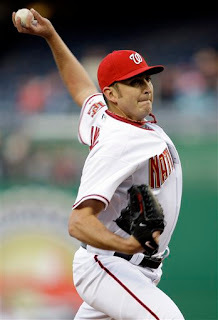 John Lannan, Scott Olsen and Jordan Zimmermann can square around and let the ball hit their bat. All three have been able to help themselves at the plate. Sacrificing a runner up, because as we have all come to know, every single run counts when Our Washington Nationals are on the field of play. Troubled to know Our Bullpen has been worse than advertised. The World Baseball Classic may be good for the long term prospects of baseball throughout the world, but when it's played during Spring Training, who really believes Joel Hanrahan and Saul Rivera got in their proper training-preparing for The Major League Season, not a three week exhibition. 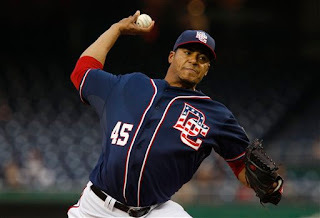 How can any pitcher, not ready to go full throttle for Opening Day, not expect to hurt themselves in a pressure situation pitching for their country--in March-- knowing all their countrymen WANT THEM TO RECORD THAT OUT. Not a good thing, and Hanrahan's & Rivera's struggles are just the beginning of Washington's early season problems. 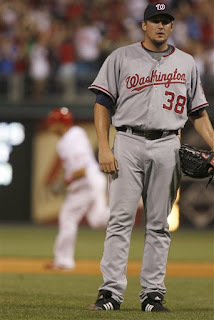 Except for Joel Beimel and the rubber armed Julian Tavarez, Washington's Bullpen is in shambles. Combined, Our Relievers have played so poorly, their efforts have setback The Curly "W"'s decisively this April. That, and the very fact, some shoddy fielding hasn't helped either. Both needs are solvable, especially if some of our players show better confidence in their abilities. Enchanted to know that Ryan Zimmerman can relax, be himself, and maybe become the quality all-around performer so many expect. Humble, Hard Working and just a Decent Young Man-who wouldn't want to see Zimmy truly become The Face Of Our Franchise? Now locked in for Five Guaranteed Years. No going to arbitration where the team needs to knock him down. No misconceptions where The Franchise and Ryan both feel about his self-worth. Already a terrific fielder and clutch hitter, Our Number 11 can take his game to the next level--without fear of a contract looming. Off the field business, getting in the way of his professional play and approach on the diamond. That my friends, is enchanting to know--along with the other Zimmermann--named Jordan--The Unofficial New Mayor Of NatsTown--according to "The Boys Of Summer"--Charlie Slowes & Dave Jageler. Ryan Zimmerman will man third base, barring injuring, until 2013. And Our New Number 27 with "NN" at the end of his name will be throwing his confident stuff alongside him. Enchanting to know, two Zimmy's are even better than one. Humbled to know that Our Washington Nationals haven't put it all together on the field of play. For the first three years in DC, Washington's Bullpen was Our Strength, now it's Our Biggest Weakness. When we couldn't score runs from 2005 to 2007, Gary Majewski, Luis Ayala, Jon Rauch and Chad Cordero were many times there to shut the door and record that Curly "W" In The Books. The Bang!! Zoom!! Of The Fireworks!! that had many a Washingtonian, Virginian and Marylander excited about Major League Baseball in Washington. Now--when we can score runs--we can't hold many leads. And it's humbling to witness a poor 2008 season, followed by an equally unimpressive 2009 start knowing Our Fans are turning away from Our Washington Nationals--disappointed over the current failures. Yes, that's humbling, but when Our Washington Nationals turn the corner, which may be nearer than some believe, and begin to win more consistently, these rougher times will be looked back on in fondness by The African Queen and I, knowing we have been there every step of the way. Remember, this is a journey, not a sprint. Adventure filled with twists & turns, mountains to climb and valleys to traverse, highs and lows. In many respects, baseball is soul searching, the only sport were every little aspect is scrutinized, taken so seriously, rehashed to the nth degree. No doubt, baseball is where solutions are found to problems and experience leads to success. Like life itself--baseball reflects a mirror image of the daily grind. And The President Of The United States understood that during his elongated answer to Mr. Zeleny's four pronged question last night in The White House. 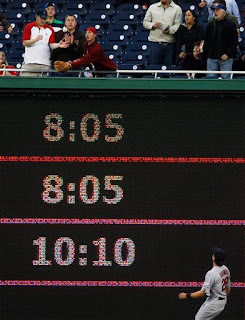 Yes, April 2009 for Our Washington Nationals has been surprising, troubling, enchanting and humbling--frustrating and enlightening might also be included. President Obama believing his first 100 Days in office were just as much the same. But no one should lose sight of the very fact that those varied feelings are similar to what most everyone deals with every single day of our lives. So Let's Play Ball! Go Nats!! After surviving last night's "Nearly Speechless" loss, The African Queen and I slept it off and awoke this morning ready to root on Our Washington Nationals again tonight--as always. And we were ready, watching the entire game on MASN, while listening to Charlie Slowes and Dave Jageler on WFED 1500AM. Although, we are pretty sure some of our fellow citizens of NatsTown were watching a rousing Game 7 Hockey Playoff Match between The Washington Capitals & New York Rangers from Verizon Center. A series decider that found The Caps coming all the way back from a 3 games to 1 deficit to advance to the next round of The Stanley Cup Playoffs. But for us, our attention was focused on South Philadelphia where Our Washington Nationals suffered badly last night and then played this evening in a manner that could best be described as The Hangover Effect. Monday's demoralizing defeat, setting the table for a sparkless performance this evening. Body language means everything and it clearly seemed as if everyone playing for Washington was a little down. Understandably so, our players still appeared a bit stunned and slightly dazed. While we were hoping DC's Team could bounce back with a feel good victory, tonight's 19th game of 2009 turned out to be a very flat affair. Washington never really got untracked and The Philadelphia Phillies continued to bang the baseball all over their puny ballpark while taking advantage of a few key DC miscues. Again not playing perfect baseball, a five run bottom of the 3rd inning by The Phillies was the microcosm of this entire game. 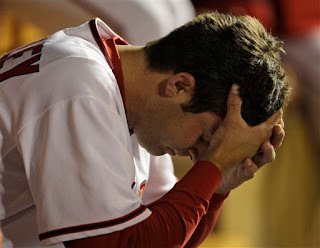 Our Washington Nationals can not make even the slightest mistake these days and NOT get punished by The Baseball Gods. During this evening's 3rd frame, John Lannan served up an off-speed pitch right over the plate to Chase Utley and the Philadelphia All-Star made Our Number 31 pay for it with a two-run homer to right. Not a decisive blow by any means, but hurtful when Alberto Gonzalez committed his 6th fielding error with two outs moments later. Another misstep that found Lannan flustered. John then walking last night's Philly Hero, Raul Ibanez, on four pitches--only to find Pedro Feliz taking John deep, one hitter later, over the left field wall for a quick 5-0 lead. Mental mistakes and pitching command issues directly leading to The Phillies taking advantage of John Lannan. As sharp as Lannan was last Thursday Night in that extraordinary 1-0 loss to The Atlanta Braves at Nationals Park, Our Number 31 was merely average tonight--at best. Three total homers allowed (two to Utley), nines base hits, two walks, John wasn't sharp. And when The Defending Champions pounced on Washington's lapses again--this game was over--quickly. Staggered and unable to mount any serious comeback, Our Washington Nationals played under what looked to be the effects of a hangover. That pounding migraine you just want to go away, but instead lingers and makes you feel even worse for another 24 hour period. Final Score from Citizens Bank Park, The Philadelphia Phillies 7 and Our Washington Nationals 1. A ball game in which Washington never really had a chance to win. On the bright side, Ryan Zimmerman extended his hitting streak to 17 games with a 1st inning double tonight. And Adam Dunn continues to get on base and slam the baseball. His 6th Home Run this evening to go along with another single and walk, leaving Dunn with a robust .328 Batting Average by the end of this game. Phillies Starter and 2008 World Series MVP, Coles Hamels, twisted his left ankle in the top of the 5th attempting to field a John Lannan bunt. After first believing he was fine, further warmups showed Hamels was hurting and he left the game, replaced by Chad Durbin. Durbin rewarded The Vulture Win as Cole did not finish the required 5 complete innings. You could tell Hamels was miffed he had to leave the game. The Bullpen By Committee Approach now in the works for Washington. Joel Hanrahan relieved of the closer duties as of today. Garrett Mock not the 8th inning guy. Joe Beimel expected to become closer when he returns from The DL on May 6th. Assistant GM Mike Rizzo stating tonight that Julian Tavarez, Kip Wells and Beimel will get the load of the late inning work in close games for the time being. Note how all three of those veteran pitchers are his personal roster pickups after taking over for the departed Jim Bowden. Willie Harris returned to the 25-Man Roster before tonight's game. Justin Maxwell optioned to AAA Syracuse. Cristian Guzman expected to be activated for tomorrow night's series finale against The Phillies. A corresponding roster move will have to be made. Alex Cintron or Alberto Gonzalez on the bubble to be optioned. "The Guz" will bat leadoff for the time being. He doesn't walk much, but he is the best choice for now. Washington now 4-15 on the 2009 Season, 7.5 games out of first place. Interestingly, if not for playing Washington and winning--The Florida Marlins would be 6-8 over all. The Phillies 8-7, The Braves 6-8 and The Mets 7-10. If Our Washington Nationals had played well enough to win five of the late inning games they blew--they would be in the middle of the pack in a struggling National League East. Instead, they find themselves well at the bottom of the division. Finally, The African Queen joked tonight--it takes a strong stomach to stay a solid citizen of NatsTown. And we are not wavering. The African Queen and I cheer for Our Players. We wish for all of them to do well. But one of the toughest aspects of being a fan is when those players you really like, and enjoy, are released, traded or moved off the roster of Our Washington Nationals--No longer With Our Team. An official changeover that occurred today when Steven Shell elected Free Agency after Washington designated him for assignment 10 days ago. Since the very first day we met him at Nationals Park, Sohna has always called the soft spoken and well mannered Steven Shell her "Southern Gentleman". Personable and nice, Steven enjoyed the camaraderie of it all. In fact, we laughed along with Steven at Spring Training, this past February, when he mentioned how happy he was when his Mom called him from Texas to tell him how much she enjoyed Our Spring Training Interview with Shell. That's the part of our fun we most enjoy. It's more than just the games sometimes. It's about people connecting. So upon hearing that Steven Shell had elected Free Agency this afternoon instead of reporting to AAA Syracuse, The African Queen and I were saddened a little bit. But happy that Steven Shell will get another chance to show whether he is a Major League Quality Pitcher for another Franchise. Wherever Steven Shell ends up, rest assured, we will be rooting for The African Queen's Southern Gentleman to succeed. The May 2nd Washington Nationals Dream Foundation Gala will be recorded by The Mid-Atlantic Sports Network and turned into a Special 30-Minute Program to air on MASN during the month of May. As well covered here on Nats320, The Dream Foundation has reached out each of the past four years to help those within the very community in which Our Washington Nationals play Major League Baseball. From The Children's National Medical Center--to The Boys & Girls Clubs Of Washington--The D.C. Baseball Academy--to The Earth Conservation Corp--and all the way to Rebuilding Together--The Washington Nationals Dream Foundation Neighborhood Initiatives spotlight the many good things a Professional Sports Team can do for their city. The Popular Yearly Black Tie Event, to be held at The Gaylord National Resort for the second consecutive year, is one of The Dream Foundation's biggest fundraisers. If you are interested in attending The 2009 Gala, here's the link for information. Scheduled MASN broadcast dates are currently set for May 11th, 15th, 16th & 17th. (Washington D.C.) - MASN, the local leader in live sports entertainment and the television home of the Washington Nationals, will televise a network special about the team's annual Washington Nationals Dream Foundation Gala. The special will air a week after the Dream Gala, which takes place on May 2, 2009 at Gaylord National Resort and Convention Center at the National Harbor. The Gala is an annual black-tie fundraising event for the Foundation, featuring dinner, dancing, special appearances by Washington Nationals players, coaches and executives, as well as a live and silent auction. MASN's coverage will allow fans at home to relive the memorable evening with interviews featuring Principal Owner Mark Lerner, President Stan Kasten, Washington Nationals Dream Foundation Chairwoman, Marla Lerner Tanenbaum and more. Hosted by MASN broadcasters Bob Carpenter, Rob Dibble and Debbi Taylor, the program will give viewers a sense of the important community outreach conducted by the Foundation, while providing an inside look at the sights and sounds from the evening. "Our annual Gala is an evening in which the entire team participates in the celebration of our community efforts," commented Marla Lerner Tanenbaum, chairwoman of the Foundation. "MASN's special feature will be a great opportunity for our fans to learn more about our work in the Washington Metropolitan area." MASN will explore the Washington Nationals ongoing partnerships with the Boys and Girls Club of Greater Washington and the Earth Conservation Corps (ECC), both of whom benefit from funds raised at the charity gala. The Nationals have made a long term commitment to support the Boys & Girls Club branches in the neighborhood of the ballpark. These branches provide athletic, academic and life skills assistance to children who live not far from Nationals Park and the ECC is known particularly for its devotion to the health and improvement of the Anacostia River. Both of these partnerships reflect the Washington Nationals robust commitment to serving the community around the ballpark. "The Washington Nationals continue to have a powerful positive impact on the communities surrounding Nationals Park because of their outstanding stewardship," said MASN spokesman Todd Webster. "This special will allow MASN to highlight those partnerships that continue to have an immediate affect on the children, families and environment near the ballpark." MASN's half hour special of the Washington Nationals Dream Foundation Gala will debut on May 11th at 9 p.m. prior to Nats Xtra, the network's Nationals pregame show. Three additional replays will air throughout the following week immediately following Nats Xtra. With every available Nationals game, an All Star talent team, 105 high definition broadcasts and pre and post game shows before and after every game, MASN is maximum access to the Washington Nationals. MASNsports.com provides extensive online coverage of the Washington Nationals with Phil Wood's "Wood on the Ball," a dedicated beat writer, Pete McElroy, talent blogs featuring Debbi Taylor, Bob Carpenter, Johnny Holliday, and Byron Kerr, a Nationals Buzz blog, up to the minute video clips in MASN's Media Lounge, series previews, live game blogs and more. MASN is currently carried on 23 cable and satellite providers throughout a seven-state region. The Washington Nationals Dream Foundation and the Washington Nationals Baseball Club are committed to community partnerships that improve the lives of children and families across the Washington Capital Region. The Foundation's cornerstone programs are focused on children's education, health and recreation. A 501(c)3 charitable organization, the Washington Nationals Dream Foundation has committed to, among other projects, a partnership with the D.C. Government to build the Washington Nationals Youth Baseball Academy to teach the game of baseball and provide after school educational programs for children in the DC region. Our Manager Manny Acta was slowly walking to the mound. Before he got there to replace Our Starting Pitcher this afternoon, Adam Dunn already had his right arm around Jordan Zimmermann--giving his personal vote of confidence and thanks. Our Number 27 touched by the gesture clearly saying "Thank You" to Dunn. Everyone within Our Washington Nationals Organization and Our Fans should all be giving their thanks to J-Z as well. For over five innings this afternoon at New Citi Field in Queens, Zimmermann again showed why his valiant work over the past week is one of our best and brightest hopes for Baseball In Washington, D.C. There's a New Fledgling Mayor Of NatsTown and he's caught every one's attention. Although Jordan Zimmermann struggled early this Sunday, he regained his composure and never wavered on the mound. Confidence repeated throughout this performance--none better than his display to finish off the bottom of the 5th. Already ahead 8-1 against The New York Mets with his Washington teammates providing some serious lumber, Zimmermann was facing the heart of the powerful Mets lineup. Already, Alex Cora had led off with a walk. The speedy Jose Reyes followed with a slapped single to right. You had to figure Manny Acta was considering making a pitching change. It was a hot and humid day in New York. And Jordan was approaching 90 pitches. There was nobody out and Daniel Murphy, Carlos Beltran and Carlos Delgado were all coming to take their whacks for The Mets against a rookie hurler pitching in just his second Major League game. A Game Changing Moment was possibly at hand. The distinct possibility for A New York Comeback. Over the course of the next three batters--a few New York Minutes--Jordan Zimmermann showed the muster of a wily veteran. Big League Pitching on display for Washington when after Murphy got ahead in the count 2-0 on Our Number 27, Zimmermann--on a hitter's pitch--jammed a 93 MPH fastball in on the lefthanded swinging New Yorker's fists. A fearless strike zone toss that resulted in Murphy popping up weakly right back to Jordan standing on the back of the mound. This was no backdoor politician at work. The Fledgling Mayor Of NatsTown was publicly displaying his talent for leadership. Ahead in the game score, behind in the count, Jordan Zimmermann DID NOT BACK DOWN. He kept going after The Mets Lineup. 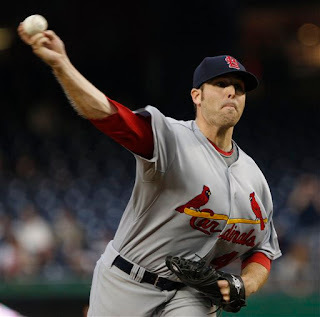 Steady Nerves on display, when J-Zimm fired away on the always dangerous Carlos Beltran. A hitter that has consistently feasted on Washington pitching. But on this Sunday afternoon, Jordan served a new diet of his own to Beltran--striking him out on five pitches in this important 5th frame. His last toss a wicked tailing away fastball. A 95 MPH heater that had Carlos not even close to hitting while swinging. Unable to put the ball in play--which Carlos Delgado was able to manage but only of the foul variety--when Jordan Zimmermann crossed up the slugging Delgado to end this fabulously pitched inning with a 78 MPH changeup resulting in a weak pop up handled easily by Ryan Zimmmerman at third base. This inning now over. The votes all in. J-Z wins in a landslide. Call that performance bold, gutsy, maybe even spunky--call it whatever you want. 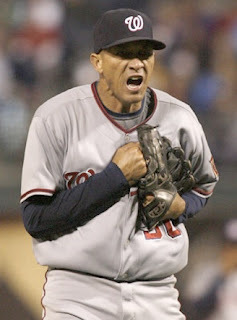 But Our Washington Nationals haven't seen such indomitable spirit like that on the mound in some time. 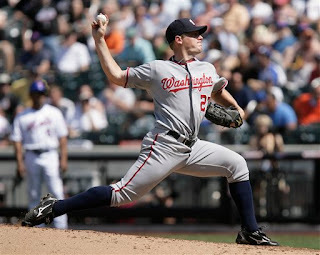 Jordan Zimmermann made everyone else wearing the Gray Curly "W" Script Away Washington Jerseys today look better because he was pitching his heart out on the mound. And his teammates were punching that winning ticket alongside him to victory. The weather was hot and humid, but Washington wasn't wilting under such a lionhearted effort shown by their 22 Year Old Starter. No, Jordan Zimmermann wasn't overly sharp at the start. New York got to him early for a first inning run and Z-J even threw away a pickoff throw for his first fielding error of his Major League Ball Career. But he DIDN'T get rattled. He didn't falter and when Our Manager Manny Acta took the ball from his hand in the top of the 6th inning after striking out David Wright for the third time this Sunday and allowing his final baserunner--a single by My Main Man!! Ryan Church--those 103 pitches he so gallantly tossed lifted the spirits of a fumbling team and their anguished fans looking for any positive outlook after two days of demoralizing baseball played at New Citi Field. Yes, today was certainly a Team Effort by Our Washington Nationals. Our Offense voted early and often--coming untracked, knocking The Mets Starter Oliver Perez all over and out of the running for the high honors at the New Queens Ballpark. And while Zimmermann was praised for his campaign, Perez was booed right out the park by his own home faithful. But make no mistake about it, D.C.'s team would have never regained their confidence if not for the unflinching performance on the mound by Young Jordan Zimmeramann. Final Score from blistering hot New Citi Field--Our Washington Nationals 8 and The New York Mets 1. Curly "W" Number 4 of 2009 was the first no doubt victory of this still young season. In fact, the very first road victory since September of 2008--a span covering 17 ball games. A breather from the embarrassment that was called Major League Baseball played yesterday afternoon in New York City by Our Washington Nationals. A new tone set thanks to Our New Number 27's impressive early run. His youthful exuberance which resonated throughout D.C.'s Team all day. Good pitching, solid hitting and decent defense can go along way to heal the pain of the many losses so far this season. But more importantly, having a Fresh Young Face leading this campaign--someone to rally around--made watching Our Washington Nationals play today more enjoyable than at any moment so far this year. Yes, when the votes were finally all tallied late this afternoon Jordan Zimmermann could probably be elected 'Mayor Of NatsTown' right now--stated Charlie Slowes on WFED 1500 AM. Charlie might be right. And no, we are not attempting to place too much pressure on such an outstanding young talent just completing his second Big League Start. It's just fun to play with. But then again--considering how unflappable J-Z has been so far, nothing this fine young man accomplishes would surprise us. The Fledgling Mayor Of NatsTown--Jordan Zimmermann's composure--is absolutely outstanding. How refreshing is that for any fan of Our Washington Nationals. And for the record, as many of you know nicknames are big here on Nats320. Jordan's Father, Jeff, heard The African Queen last week call his son sometimes "Z-Zimm" and other times "J-Z". Sohna asked Mr. Zimmermann which moniker he would prefer. His response: "I like J-Z, it has a ring to it." So for The Fledgling Mayor Of NatsTown it's Official: "J-Z". Zimmermann would finish this day with a solid 2.38 ERA. He allowed six hits, 2 walks and struck out five, including David Wright those three times, The Carlos'--Beltran and Delgado one apiece. He remained steady when Delgado ripped a fastball to right center scoring Beltran in the first. A play that Justin Maxwell, starting in centerfield for Elijah Dukes, made an excellent attempt to grab. Diving to his left, the ball glanced off his glove. A resultant triple that if caught would have been The Highlight Reel Defensive Play of This Game. J-Z holding his own after he threw a pickoff toss away to Adam Dunn at first base in the second trying to hold Ryan Church who had walked. His first error that found Zimmermann bearing down again with a runner in scoring position with one out. Luis Castillo subsequently grounding out to first base and finally retiring the pesky Jose Reyes on a fly ball to Austin Kearns in right after a Oliver Perez bunt single. One thing clear about Jordan Zimmermann, he battles every step of the way. He challenges hitters and that alone is very impressive. Jordan now 2-0 in his Major League Career. All four Curly "W"s in 2009 earned by Rookie Pitchers. Shairon Martis has the other two wins. When Zimmermann left this game up 7 runs, Mike Hinckley, Garrett Mock and Kip Wells finished the final 3.2 innings of work to get the Curly "W"--allowing no hits and just one walk--charged to Mock. 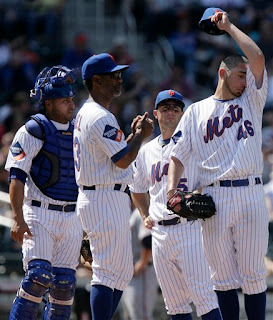 The New York Mets powerful offense was neutralized this day. Austin Kearns is hot at the plate. Jesus Flores is on fire. Both slamming home runs this Sunday. "Bluegrass" a blast to the deepest reaches of centerfield at Citi Field in the 5th--just to the right of the Red Mets Big Apple that comes up after New York Home Runs. Flores a two run shot in the top of the second off Perez as well that got Washington on the board for the first time today. Kearns scoring three runs, knocking in one (11 RBI so far) and raising his average to .256. Flores, he of the terrible slump during most of the recent homestand, breaking out in a big way with a 3 for 4 performance, one walk, three RBI (10 overall), two runs scored and now batting a robust .327. What a night and day difference in Our Number 3 at the plate than he was less than one week ago. No longer looking lost at the plate. Justin Maxwell played very well batting leadoff. Two hits, one walk, one run scored, one rbi, two stolen bases and a gazelle with speed, makes this fine young man always easy to root for. Everyone seemingly wants to see J-Max play and do well. Can Our Washington Nationals find a solid role for him? He is so deserving the legitimate shot. Only injuries have curtailed his career. Alberto Gonzalez breaking out of a terrible slump over the past homestand. Garnering two hits filling in for the injured Cristian Guzman today, scoring one, knocking in one and playing the solid defense he is known for--not the erratic play witnessed by Our Number 12 last week. Adam Dunn the only everyday player not either scoring a run or knocking a run in this Sunday afternoon. The Mets Starter, Oliver Perez, wasn't too good. Neither was his first replacement--Casey Fossum. Finally, very sorry to see Shawn Hill go down again last night in San Diego with more forearm and elbow soreness. Another trip to The Disabled List for our one time starter. Some guys never catch a good break and it's sad to see such a very talented young man continue to not reach HIS potential. Don't want to hear any excuses. Not--Our Pitchers need to throw more strikes. Not--Our Fielders need to concentrate more and make less errors. Not--Our Hitters need to be more focused at the plate. You guys are professional. You should know what each of you is capable of doing. This Is Major League Baseball after all. You should know what is expected of you. And we don't care whether any player for Our Washington Nationals has been in the Big Leagues for 10 Days or 10 Years, each should also be responsible enough to play the game on the biggest stage. Act And Play Like You Belong There. After today's 16th game of 2009--you really had to wonder. 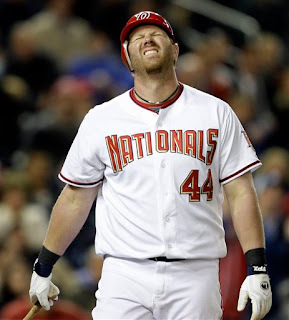 Our Washington Nationals now find themselves in a big hole--10 games down in the loss column. 3-13 Overall, already 8 Games out of First Place. A position not wanted on many levels. But bearable if you believe everyone is working hard--and not giving up. What Our Washington Nationals are doing right now is giving games away. They are taking away virtually all their chances to win. Remember, most every team loses 1/3rd of all their games every year--54 Total. Most every team wins 54 games each season. And what every team does in those final 54 games to fill out the 162 Game Schedule decides whether you are Good, Bad or Ugly. At this point in April, Our Washington Nationals are losing each of those other 54 games. They are playing some ugly baseball and they need to get ahold of themselves on that issue. You can't continuously throw balls off the plate from the mound. You can't continuously drop ground balls or fly balls hit in your direction. You can't hope Someone Else gets that key base hit. You have to be responsible for yourself, your work and your performance. Come On Guys!! We Are Better Than This. You all, collectively, need to do a better job. It's time for everyone of you, Our Players for Our Washington Nationals, to pull yourselves together and understand you have to perform on a higher level than shown so far in 2009. None of you made The Major Leagues without having talent. And none of you are less responsible than another for this early season slump. Stepping up and competing at the skill level everyone knows you are capable--is your number one goal this Saturday Evening. No. Please, no more excuses. Time to Play Ball!! Major League Baseball on the skills level considered acceptable. The African Queen and I can put up with the losses. We can suffer through the rebuilding of Our Franchise with the very best of those out there. We Care and We Love Our Team. And we want to see Our Washington Nationals do better--eventually win consistently. We've always been there for you and always will. The winning is coming. That fact Sohna and I have no doubt. 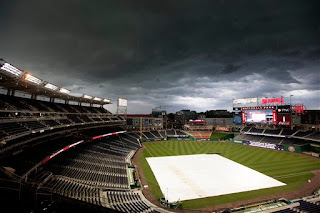 But whether Our Washington Nationals are Good, Bad Or Ugly-- we want to watch Professional Major League Baseball in Washington, DC--knowing every single one of you is giving their very best effort out there on the field of play--each and every day. We know, that's some Tough Love. But it's how The African Queen and I feel this evening. Don't Give Up. LIKE EVER!! No matter how bad it seems. You know, Sohna and I will always be there for you--ALWAYS. Jesus Flores has just cranked out a homer in the top of the 9th inning off Francisco Rodriguez. A two run shot with nobody out that puts Our Washington Nationals within striking distance of tying this game up against The New York Mets. K-Rod is in trouble ahead now only 4-3. But after Alberto Gonzalez lines out to center, Our Manager Manny Acta sends Alex Cintron to pinch hit for Pitcher Kip Wells. This is the 9th Inning. At this point in the game, it's important to make every effort to get even. In a game where there is no clock, time was running out. Score One Run. Because if you don't--GAME OVER. Anderson Hernandez is the scheduled hitter after Cintron. Not a power hitter, an infielder also slumping at the plate. So unless you get lucky, the worst hitter on your team--Cintron--is not the man to have come to the plate under this circumstance. Veteran Experience in Ronnie Belliard is sitting on the bench. Youthful and powerful Justin Maxwell is sitting on the bench. Both, better choices to pinch hit with one out in the 9th, down one run. We don't understand that move. We really don't. And it's a shame this game ended in such a poor way, because Scott Olsen fought, and fought and fought his way through six tough innings. Tonight at New Citi Field, Our Number 19 showed some of that bulldog spirit which he portrayed during his Florida Marlin years. He was impressive. Far from perfect, in trouble every inning, yet he battled the entire way. Olsen earned some deserved respect in Queens from The Mets lineup. Appreciation which Our Batters will never earn until they more consistently plate runners in scoring position. Like the same old story, told over and over again--Our Washington Nationals spoiling their winning chances when they again left runners in scoring position. Facing arguably the best pitcher in the game, Johan Santana came out of the gate throwing hard tonight, firing strike after strike, looking sharp and mowing down 10 Washington hitters before he tired in the 6th. The very inning when DC's team had their opportunity to get back into this affair and BEAT HIM. Johan was faltering--ripe for the taking. 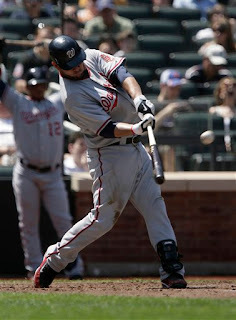 And Our Washington Nationals COULD NOT get the big hit. The 2-3-4 hitters were doing their jobs. The 5-6-7 hitters could barely even get their bats on the ball. Despite a terrific Nick Johnson lined opposite field homer directly down the left field line for his first Round Tripper since May, 2008--a Ryan Zimmerman walk and Adam Dunn single--all with no outs in this important 6th frame--the next three hitters in our lineup could not get them home. Elijah Dukes flailing at everything Santana threw him--striking out for the 3rd time this evening. Austin Kearns going down swinging for his second time this evening. And Jesus Flores barely getting his bat on Santana's last of 104 pitches thrown in this game--meekly popping to end the threat. 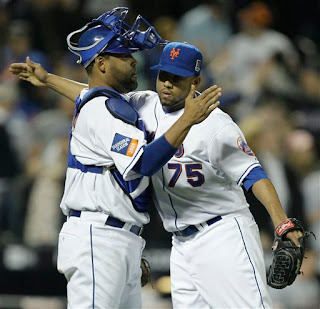 Understanding Johan Santana is an exceptional talent, he was still in trouble. Yet Number 57 wearing White/Blue & Orange was able to reach back and find that extra effort to survive. Looking to wreak havoc, Our Washington Nationals couldn't muster even a simple base hit. The game changing moment was at hand. Which brings this post back full circle to the top of the 9th when Alex Cintron was sent to the plate to pinch hit for Kip Wells. That's not stepping up, or even close to wreaking havoc. But what's very true was, like Johan Santana in the 6th, Francisco Rodriguez was also ripe for the taking in the 9th. Our Washington Nationals didn't fully take advantage of that opportunity as well. Alex Cintron? He's not even going to be on the 25 Man Roster in two weeks when Cristian Guzman and Willie Harris are activated from The Disabled List. He's Our 25th Man. That decision to bat him still makes no sense. None whatsover. Final Score from New Citi Field where that new ballpark is downright weird (especially the location of the visiting bullpen)--The New York Mets 4 and Our Washington Nationals 3. Of course it didn't help that for the second consecutive game the eventual winning run was scored on a base loaded walk. A major infraction committed again by a Washington Pitcher. This time by Kip Wells. You have to respect Scott Olsen's effort tonight. He single handedly kept Our Washington Nationals in this game for six innings. And he wasn't helped when Elijah Dukes couldn't get to/maybe misplayed a liner to center off the bat of Carlos Beltran in the 3rd that scored the first run of the evening. He wasn't helped when Austin Kearns had to dive twice in the same 6th inning for flies hit by Fernando Tatis and Daniel Murphy. The first belly flop and resultant triple by Fernando Tatis was a good effort by Kearns in which he simply could not reach. But he could have just cut it off and let Fernando get a single. Then Murphy's RBI single a few moments later deflected off Austin's glove. It was a difficult catch, but Our Number 25 should have had it. Olsen dodged trouble all night long. He really pitched well with his back against the wall. Never heard of The Mets reliever Bobby Parnell who replaced Johan Santana tonight in the 7th inning. But that young man throws smoke--reaching 96 MPH on his fastball--with some great late action. He was sharp. One rising fastball thrown past Josh Willingham was UNHITTABLE. No one was going to get a bat around on that pitch. No one. Austin Kearns did make a nice running over the shoulder catch to this new deeper area of right field at Citi Field. An extra 20 feet or more of outfield that runs between the home run wall down the right field line and right centerfield. A cutout that allowed Kearns to track an absolute blast off the bat of David Wright in the bottom of the 7th that saved Jason Bergmann from an even worse outing than he eventually had. A home run in most any Major League Park, this opposite field shot was merely a fly out. I don't like it when these new stadiums put in gimmicks just to be different. The Short Leftfield Crawford Boxes in Houston are another good example--too many cheap home runs allowed at Minute Maid Park. Just let the players play ball--don't give anyone an added advantage just to be cute. Corners in the walls--fine--but not stupid stuff like this right field extended outfield. Bergmann walking the bases loaded in his first appearance since his recall from AAA Syracuse. He looked uncomfortable and downright pissed when Manny came to take him out of the game. The same emotions Kip Wells showed after he saved Bergmann from any damage, but then fell apart in the 8th, giving up the bases loaded walk. A GIFT RUN that proved to be The Winning Run. Finally, Charlie Slowes and Dave Jageler mentioned on WFED tonight they had some serious issues with how Citi Field is set up for broadcasting. Their booth, located slightly down the first base line (same as Shea Stadium was), is situated so fans now sitting in front of them can stand up and block their view of the game. Additionally, as also shown on MASN, The Visiting Bullpen is placed behind The Mets Bullpen in rightfield. It's virtually impossible to see who is warming up for the visiting team--whether on TV or from The Radio Booth. The Mets Bullpen blocks it. The Visiting Bullpen is set up so The Visitors, in this case Washington's Players, have to look through two sets of fences to even watch the game. When Manny came out to bring in Kip Wells in the 7th, no one knew exactly which pitcher he was summoning to the mound. At one point, not knowing who was warming up for Washington, Charlie and Dave joked they needed a spy in the rightfield stands at Citi Field to let them know. A volunteer position that included Charlie pondering if Agent 99 should be dispatched for duty. She could call him on the shoe phone!! Watching and listening in our home, Agent 99 chuckled at their reference, and proclaimed she was ready for the assignment. As Charlie mentioned tonight: Like who exactly made these final decisions for placements at New Citi Field? Anyone that has ever been involved in the game of baseball? The Zero's started to mount from the very first pitch of this game. For seven consecutive innings a pitching match up not seen at Nationals Park was in the works. Two young and talented starters throwing shutout ball. One, the lefty from Long Island, New York, more the command and control pitcher. His opponent, from Willemstad, Netherlands Antilles, the righthanded possessor of challenging speed and hard breaking stuff. Preferred Weapons of a 24-Year Old American and a 23-Year Old Dutchman. This evening on South Capitol Street, both doing it their way and each receiving the same result--until their replacements decided this game. Inning after inning passed this Earth Day and John Lannan and Jair Jurrjens planted zero after zero up on the scoreboard. Locked up in a pitchers duel, these saavy young hurlers displayed a renewable resource of their very own--their talented throwing arms. Quickly, this shaped up to be one of those well thrown affairs that baseball purists can appreciate--old fashion hardball. Step to the plate, take your cuts, and mostly, then sit down. Throughout this cold and chilly night, the batters for both Our Washington Nationals and The Atlanta Braves had their shots to score. But every time a runner made their way into scoring position, either Lannan or Jurrjens found the right seed and harvested another out in the record books. Recharging their energy each frame, John and Jair threw like 10-Year Veterans. Neither looked green tonight. Yet each is coming off their 2008 Rookie Campaigns. This was good stuff and enjoyable to watch. At a time that so many hurlers in the game feel throwing five innings and giving up three runs--acceptable, Lannan and Jurrjens certainly did not tonight. Proudly, each fought their way through this scoreless affair. And only the very fact that Our Manager Manny Acta sent Austin Kearns to the plate to bat for Lannan in the bottom of the 7th with Josh Willingham standing on third base--the only reason Our Number 31 was taken out of this game so soon. 95 Pitches into his night, John was still in control and The Brav-Os weren't hitting a lick off Lannan. But Washington needed a run--desperately. John was pinch hit for and, of course, Washington failed for score. Because unfortunately for DC's Team, Jurrjens was even more so impressive and nearly made it through the 8th inning--leaving with his shutout in hand after Power Lefty Mike Gonzalez replaced him, Fresh replenishment giving Gonzalez the duty to retire The Powerful Bat of Adam Dunn back to the bench. With Ryan Zimmerman standing on first base, Gonzalez fanned Dunn looking to end Washington's last, and ultimately, final threat in this affair. On and on they played, fine defense, great pitching and no scoring. At least until Garrett Mock began to lose control in his second inning of his relief stint. A predicament set up when Mock snared a hard grounder right back to the box in the top of the 9th off the bat of Casey Kotchman. A sure inning ending double play with Matt Diaz running to second base. Garrett turned and threw to Our Shortstop for this evening, Alex Cintron. With Diaz barreling down on him at the bag, Cintron took the toss from Mock while cutting across the base--recording the out--then proceeded to throw his relay well off the bag. Kotchman would have been out by 10 feet. But Cintron winged the ball, fearing Diaz was going to hit him and the Atlanta First Baseman was safe at the bag on a fielder's choice. The turning point of this game had finally arrived. After 8 innings of solid baseball, a simple errant throw would change everything. Pounding the strike zone for 1.2 innings, Garrett Mock all of sudden got soft with a runner on first with two outs and didn't challenge The Braves' Centerfielder Jordan Schafer. A resultant frustrating full count walk putting Kotchman in scoring position. A problem made worse when Our Manager Manny Acta made the right decision to send Mike Hinckley to the mound to force Atlanta's Manager Bobby Cox to waste lefthanded pinch hitter Greg Norton for the righthanded swinging Martin Prado. A move that backfired--badly. As crisp and well played the pitching had been from both starters this evening, Mike Hinckley would perform just the opposite. Even while warming up on the mound once summoned, Hinckley tossed three wild pitches past his batterymate Jesus Flores while Home Plate Umpire Brian O'Nora stared in almost disbelief. The harbinger of things to come when Our Number 58 looked downright uncomfortable and afraid to throw his best stuff when the game restarted. Unable to find the plate, Hinckley got no help from the home plate umpire. And when he repeatedly threw pitch after pitch off the plate or in the dirt, The Atlanta Braves were GIFTED the eventual winning run--Free Of Charge. Martin Prado walking on seven pitches to load the bases. Kelly Johnson on five to win this game. 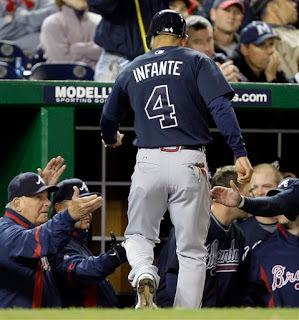 On Earth Day, The Atlanta Braves Omar Infante (running for Kotchman) expended no energy to score the only run of this game. After watching a sparkling performance of command and control by Our Starter John Lannan, those remaining among the announced crowd of 15,567 witnessed a total lack of composure by Mike Hinckley. Called on to record ONE FINAL OUT. He could not do so. He could not throw strikes. He could not plant that last seed across the plate. His renewable resource, his talented arm had failed him. On "Get Your Green On" Night, Mike Hinckley looked pretty green himself. And Our Washington Nationals would not win this game. The always tough Rafael Soriano using the natural heat from his high powered right throwing arm to close this one out for The Atlanta Braves. Final score from Nationals Park were you can't win if you don't score any runs--The Atlanta Braves 1 and Our Washington Nationals Zero. Loss Number 11 of 2009 given away when Our Bullpen couldn't throw a baseball over the plate, when the game counted the most. 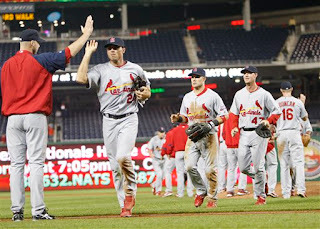 Sadly, a defeat that took away from an excellent performance from the southpaw throwing arm of John Lannan. Pitching with poise and confidence, Our Number 31 battled his way through a terrific match up. Only to see his counterpart throw equally as well. Jair Jurrjens--He's pretty good too. If Earth Day is suppose to make one reflect on what's important about the natural environment we all live in daily, then John Lannan proved tonight he's one renewable energy source Our Washington Nationals should cherish for years to come. Seven innings of shutout ball thrown by Lannan. While giving up five hits and two walks, he lowered his ERA down to 4.43. Jurrjens allowing 6 hits and 2 walks during his 7.2 innings of work. Neither strikeout pitchers, a combined six between them. Lannan and Jurrjens fully dependent on their fielders behind them. Defensive work which there was plenty to recall tonight. In the top of the 8th, Atlanta's Yunel Escobar sharply grounded a one hopper directly to the left of Ryan Zimmerman. Reacting only to the play developing in front of him, Our Number 11 quickly moved in, slightly to his left, only to see the baseball rapidly rise just to the side of his left ear. With his usual catlike reflexes, Ryan moved his fielding glove to the side of his face, while still charging in and easily threw out Escobar at first base. A defensive gem that received a nice ovation from the crowd, but was bettered thanks to Elijah Dukes. With Two Outs in the top of the 7th, Atlanta Leadoff Hitter Kelly Johnson lofted a soft dropping looper into short centerfield. Running hard from the crack of the bat, Dukes charged in quickly. And realizing the baseball still was farther from his reach, slid at the last second, feet first, but still had the wherewithal to reach with his left hand, his glove hand, across his body, turn his glove's pocket sky upward and JUST SNARE the baseball a good few inches before it hit the ground. This was a tremendous defensive effort. Athletic ability, baseball skill and excellent timing allowed Elijah Dukes to make The Defensive Play Of This Game. A sweet one that resulted in a standing ovation from the home faithful. Really nice play. Zimmerman and Josh Willingham both doubled tonight. Nick Johnson had two singles among Washington's six hits. Continuing a trend, Washington had Zimmerman on second base with a double and no outs in the 4th--didn't score. Runners on first and second, one out--didn't score--when Alex Cintron hit into a double play in the 5th. Willingham on second with his double in the 7th, no outs. No score. 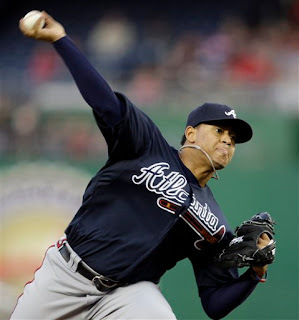 Atlanta's Jair Jurrjens made the right pitch every single time he was in trouble. This was the very first game all season that Adam Dunn had not reached base. Heading into the game with a .502 On Base Percentage, Our Number 44 neither stroked a hit or walked against Atlanta's pitching. When Kearns pinch hit for Lannan with Willingham on third base in the bottom of the 7th, Austin showed no patience and swung at Jurrjens very first offering. A changeup he believed was a fastball. A resultant popup to end the short lived rally. Cintron, filling in for the slumping Alberto Gonzalez, who was filling in for the injured Cristian Guzman--did not help tonight. A weak hitter, it was surprising to see Alex batting leadoff. But then again, Manny really didn't have anyone else available for the role. Willie Harris also still on the DL. Everybody else in our lineup slowfooted, except for maybe Dukes and Zimmerman. Cintron's days numbered once everyone comes back healthy. Harris played in a rehab game yesterday for Syracuse. Anderson Hernandez was given the night off. Ronnie Belliard and John Lannan both executed nice bunts. Mentioned only because that is a skill Our Washington Nationals have routinely been poor at since baseball returned to Washington in 2005. Adding the fact that Jordan Zimmermann executed a nice bunt himself during his first game on Monday night and things are looking up in the sacrifice department for Washington. Funny moment in tonight's game. Julian Tavarez fired a pitch to Yunel Escobar in the top of the 9th. The hard swinging Atlanta Shortstop fouled the ball off directly in front of Jesus Flores and Home Plate Umpire O'Nora. 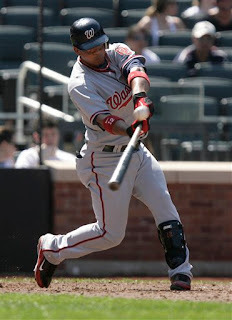 On the backswing, Escobar perfectly lined the bouncing ball into Washington's home dugout on the fly. For a good 30 seconds, Umpire O'Nora kept looking around trying to find the ball. I don't think Flores even realized what had happened. Like two men lost, they finally were told what happened by someone in Washington's Dugout. Funny. Teddy came barreling out of the centerfield gate during tonight's 4th inning Presidents Race. Leading all the way to the turn at the rightfield corner, Teddy then stopped to throw what appeared to be Green Curly "W" Baseball Caps to the crowd. Distracted once again, Abe took advantage, passed Teddy and George to take the checkered flag. The Green Curly "W" Caps were apart of tonight's Earth Day 2009 Promotion at Nationals Park. These Green Caps the same ones given out last September during the "Halfway to St. Patricks Day" Promotion. Services members honored after the third inning of each home game were donning the caps during their salute. Throughout the evening, Get Your Green On messages were displayed on the HDTV Scoreboard concerning recycling and renewable resources. As it turned out, honoring Earth Day, The African Queen and I wore the same Green Curly "W" Caps to the ballpark for tonight's game. PS--In one of those freak incidents that occur in baseball. Josh Willingham was nailed while standing in the on deck circle waiting to hit--by a baseball fouled off the bat of Elijah Dukes in the 9th inning. A hard hit liner that struck him in the left leg. That had to hurt. Williingam's going to have a nice bruise. He did eventually bat and flied out to left, but you had to wonder whether he was more seriously hurt.